Comments: Thirteen-lined ground squirrels are long, slender burrowing animals with 13 rows of yellowish stripes and spots and internal cheek pouches. They are solitary and forage during the day sitting upright periodically to check for predators. They spend the winter hibernating in their underground dens. Females bear a litter of 8-10 young in May. They can live up to 5 years. 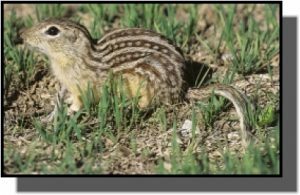 Distribution: Thirteen-lined ground squirrels are native to the prairies of the Great Plains of the United States and Canada. They are found in Kansas in prairies, overgrazed rangelands, parks, cemeteries and golf courses. Food: Thirteen-lined ground squirrels feed on grasses, seeds, insects and sometimes on small vertebrates such as small birds and reptiles.